What is it like to make a financial investment in an up-and-coming social-change leader every single day of the year? Since Jan. 1, 2013, the Pollination Project and I have been giving daily micro grants to emerging projects and inspiring people all over the world. Nearly 50 others have joined me in the practice of making a grant a day. As of Dec. 31, 2014, we will have made 790 total grants in 55 countries! Here are the extraordinary people and projects that our daily givers are honored to support this week. Climate-Change-Ready in Fiji. Janet Lotawa and the organization Rise Beyond the Reef specialize in understanding the needs of remote communities and the impact of climate change on those communities. 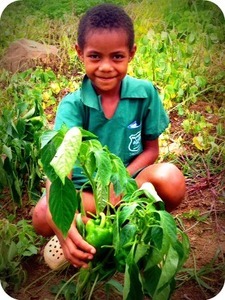 Janet's project works in Fiji's Viti Levu community, home of the last unlogged upper-mountain forests and water-catchment systems. They will create a model farm in the community, the Climate Change Ready Agro-Farm Project, to provide local students the opportunity to learn sustainable land management, nutrition and climate-change-adaption measures. Our lives are intricately connected with people in East Asia, yet these connections are deeply filtered by global capitalist interests and white supremacy. Any way we can learn about grassroots struggles and build relationships with people across the Pacific is valuable. 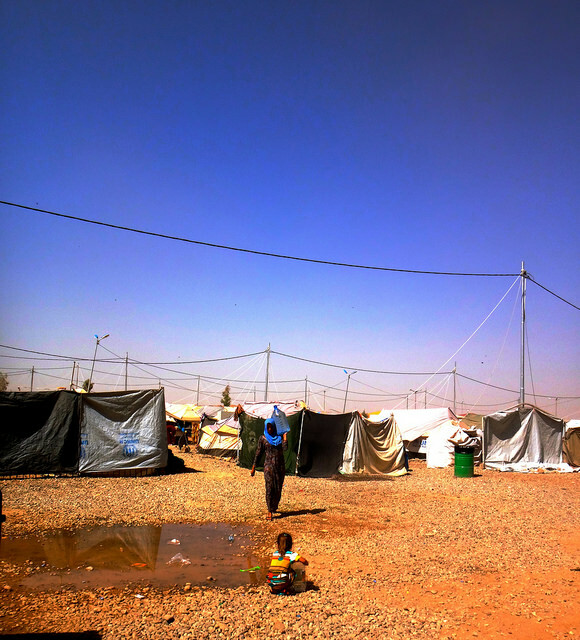 Sanitation in Iraqi Refugee Camps. After working for many years in the Middle East, promoting a link between sanitation and agriculture, Lillian Volat saw an opportunity to change refugee environmental and health problems into sustainable solutions. She created the Sustainable Sanitation for Syrian Refugees project in Iraq. Waste from Syrian refugees is becoming a source of political and social unrest in host countries. Urine contains high levels of nitrogen, phosphorus and potassium. It's also around 90-percent water. All are things that plants need to grow. Once urine is held for a 90-day period, most of the pathogens will be killed, making it safe for reuse in agricultural settings. The project will give simple, plastic, unisex urinals to Syrian-refugee families, which they can use in their tents for privacy and safety. Once the urinal collection unit is full, they will pick them up from the families and pay them a small incentive for supporting the project. The project will work with families located throughout numerous locations in Erbil, Iraq. Malaria Prevention in Nigeria. After being exposed to mosquitoes as a young boy, Oluwamayowa Salu caught malaria and subsequently missed a lot of school. The Malaria Comic Book was developed to help educate and create a malaria-informed generation and address the concerns over the high rate of deaths caused by the malaria disease in sub-Saharan Africa. The Malaria Comic Book is designed for youth ages 8 to 13 years old and will be written, printed, published, and distributed for free to five randomly selected schools. It will be written in English, the official language of communication in Nigeria, and may also be published in electronic format to allow people from all over the world to use it for educational and instructional purposes. Oluwamayowa Salu is Founder and Executive Director of Ibà (Malaria) Eradication Foundation, an organization in Lagos State, Nigeria. Art From Trash in Kenya. Sylus Owiti, in partnership with the Dunga Ecotourism and Environmental Youth Group in Kisumu, Kenya, designed a project to address the growing amount of waste generated in Dunga Beach from tourism, the fish industry, and local cafeterias. The group will construct bottle brick benches in the public spaces at the beach, providing a creative way to teach people about waste. The group hopes to promote ecotourism as a sustainable, alternative livelihood for the youth and promote environmental conservation. Trees in Chico, California. Charles Withuhn and the Chico Tree Advocates are dedicated to planting trees, encouraging citizens to attend city meetings when trees are on the agenda, and educating citizens on the value of trees. Charles explains that two years ago the city council stopped planting trees, leaving about 4,000 empty tree-planting sites. The city is cutting down trees at a much faster rate than trees are being planted. Chico Tree Advocates has put together a group of 175 volunteers to protect and defend the urban forest through an active campaign of education, planting and civic engagement. In coordination with the Department of Public Works and nearby property owners, they have identified locations and agreed on species and will plant city-street trees. "Twenty years from now our children will not remember or care about most of our current issues," Charles said, "but our urban forest is a gift from our fathers' fathers. We don't want to be the generation that was too busy to protect and plant trees." Want to be part of the joy of giving with us? Join our Daily Giving Community, or simply create your own giving practice. It will change your life!